So along with the rest of the world, you smiled. You waved. You went outside on July 19, wherever you were, and looked upwards and out into the solar system knowing that our robotic representative Cassini would be capturing a few pixels’ worth of photons bouncing off our planet when they eventually reached Saturn, 900 million miles away. But did Cassini actually capture any photons coming from where you were? The image above will tell you. Before Cassini took its images — several hours before, in fact — the MESSENGER spacecraft was holding some photo shoots of its own from 61 million miles in the other direction! The image above shows the side of Earth that was facing Mercury on the morning of July 19, 2013, when MESSENGER was acquiring images in our direction during a hunt for any possible satellites of the innermost planet. Earth was as bright (-4.8 magnitude) as the maximum brightness of Venus at the moment the image was taken from Mercury. For both portrayals, high-resolution black and white images from the GOES East and Meteosat meteorological satellites were combined with color information from NASA Visible Earth to generate true-color images of our planet as it would have looked to each respective imaging spacecraft… if they had the impossibly-precise optics to resolve Earth from such distances, of course. But it’s ok that they don’t… we can still use our imaginations. Read more here on the PHL’s news release. 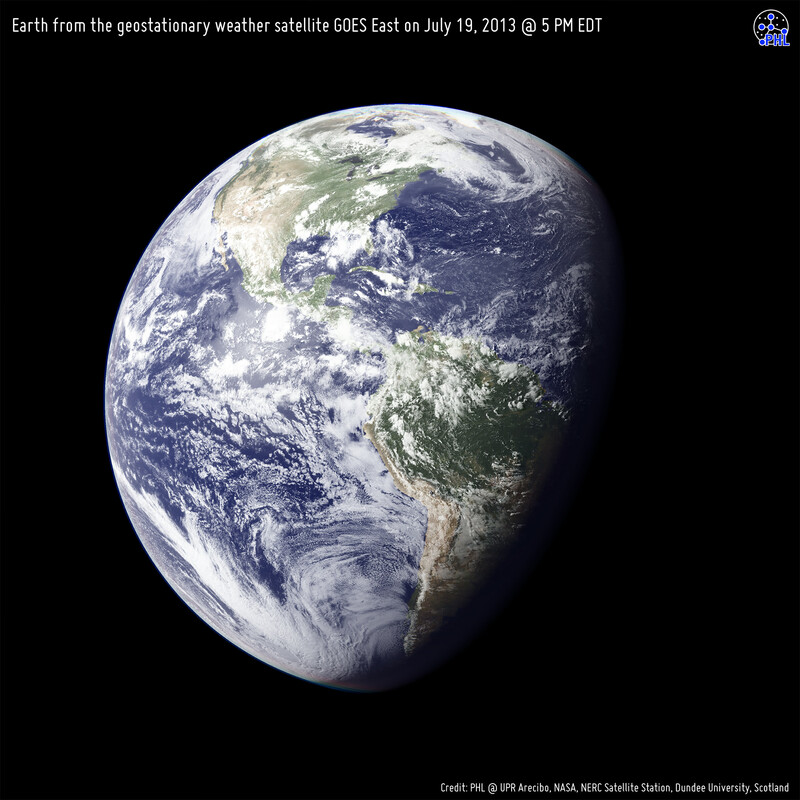 Earth from the geostationary weather satellite GOES East on July 19, 2013 at 5 PM EST. This is approximately the view that Cassini would have had of Earth during imaging. Image credits: PHL @ UPR Arecibo, NASA/Johns Hopkins University Applied Physics Laboratory/Carnegie Institution of Washington, NERC Satellite Station, Dundee University, Scotland. Thanks to Prof. Abel Méndez (PHL/UCR) for the heads-up on these. There I am! Right there! Hi, Saturn! Something’s not quite right about that apparent view from Saturn. With Saturn having an elongation of slightly more than 90 degrees, half of the Earth should be in shadow…quite contrary to that presented. Additionally, that image has Saturn rather near transiting the meridian at that time for eastern US observers whereas it was further east in the sky. Hate being the bearer of bad news but a different satellite perspective would be more appropriate. You said it yourself… with Saturn “slightly more than 90 degrees” (from a line drawn between the Earth and Sun – with Earth more than 90 degrees ‘ahead’ of Saturn’s position against the bg sky), Earth would indeed be ‘slightly more’ than half illuminated. To the contrary…perhaps you don’t understand what elongation means? A full moon is near 180 degrees elongation, yet an observer on the moon would see a ‘new’ or unilluminated Earth. Saturn was near 97 degrees elongation so Earth is not quite yet 90 degrees ahead of Saturn…it has yet to reach quadrature. This happens near the 28th of July…on which day Saturn would see half of Earth illuminated and gradually increasing in apparent illumination until solar conjunction. Previous PostPrevious What Can You Do With a Cubesat?